Please share it in a comment. I will take one entry per comment. And in 1 month July 1st I will put all the entries a hat (really an online randomizer). The winner will receive the MATCHING PAIR! One lucky contributor will have an #FF Original to keep. Sarah of Miss Sarah’s Storytime is our lovely hostess this week. Happy June! Categories: ALL, Flannel Friday | Tags: crowdsourcing | Permalink. I noticed that there is one happy sock and two other emotions…mad and sad? Maybe put a happy one on one foot and another emotion on the other foot. 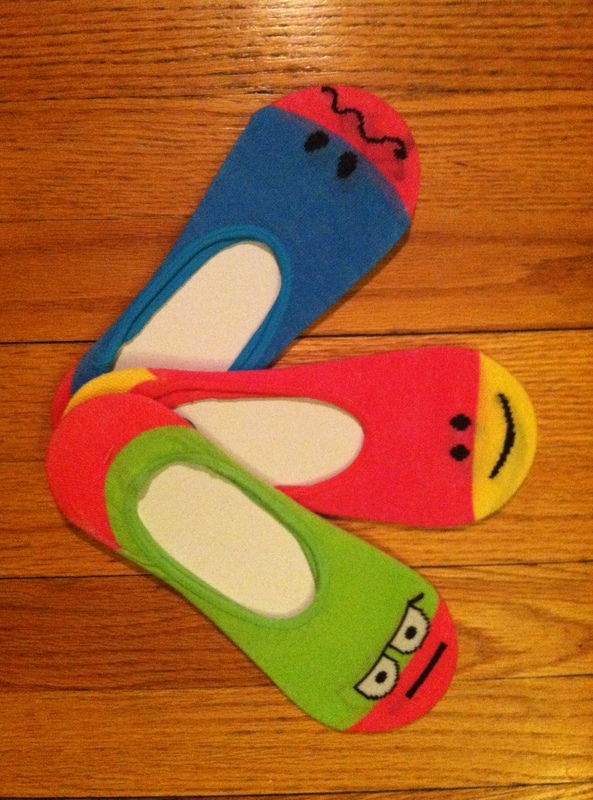 Then you can tell a story about how something happened and this made him happy…..stick out happy foot. Then something else happened and this made him mad….stick out mad foot. But then this happened and he was happy again (not sure when those socks became boys but apparently so…). A cause/effect idea. Kate! I am sorry, I’ve had a flood of email in the lst couple of weeks, I didn’t see this comment notification! I apologize for the delay! i love these ideas! And that is very true about leaving out 1 for certain stories. the 2 polar opposite of happy vs. sad is a common theme in childrens’ stories. And that being said, you could see the squiggly mouth as a worried expression. Paired with the big smile you have 2 personalities that resemble a friendship dynamic similar to that of Elephant & Piggie. Maybe? kinda, sorta? Well that might be a stretch, but this is free association people! My first thought was a “Three little pigs” style story. Where they all have a common goal but each one handles it differently depending on their personality. Perhaps they could end up fighting and think that each one has the best idea of how to attain said goal but in the end they realize that working together is the best way to get what they want. What a brilliant idea Trista! In fact, I’ve always had a weird obsession with the 3 little pigs. I guess you could call it a thinkertoy of sorts. Periodically, I imagine what life would be like after I think of different scenarios in which the 3 little pigs approach new endeavors with similar methods to those used during the construction of their houses: having setting into their new living situation (all 3 pigs in the sturdy brick house) find themselves approaching a new endeavors with the mindsets demonstrated in the original story: 1) very lazy 2) kinda lazy 3) diligent. Some that stick out in my mind are making pancakes, planning a trip, and so on. Thanks smarty!